Over the weekend the King and I made our first maiden voyage to the Kane County Flea Market. It is held the second weekend of every month at the Kane County Fairgrounds and is only about 30 minutes from us. That's pretty awesome dangerous for me. And remember I've been banned from buying anything weighing more than 10 pounds and no more furniture. They boast to be the largest Flea Market in Illinois and I'd say they might be right. It was pretty big. Maybe not quite as big as Canton TX but it was adequate and I was pooped at the end of the day. I did refrain from quite a few things. One thing I refrained from that I shouldn't have.... There was a vintage featherweight sewing machine in the case in top notch condition for only $150. Me in my cheap, tightwad mode offered the lady $100 for it and she said she'd think about it and for me to check back before I left. I forgot to go back... I should have just paid her the $150! Oh well (sigh)! But what I did buy was this. 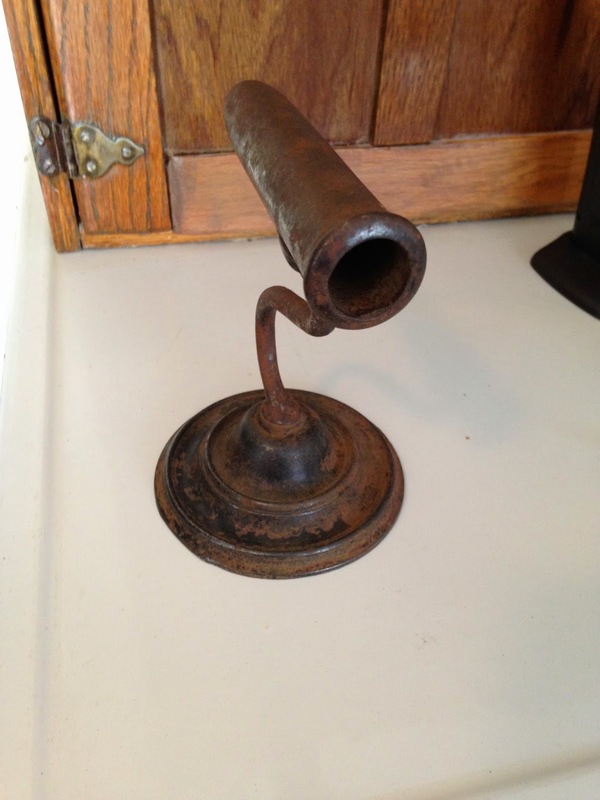 I was told it was an antique iron of some sorts. I only paid $12 for it. But I can't find any info on it. Does anyone know what it is called or how it was used? Updated 4/13/15 10:05 p.m. - After posting an SOS on a Facebook page I'm a member of, I have an answer. It is called a Goffering Iron, used to press collars and ruffles from the mid to late 1800's. You can read about it here. 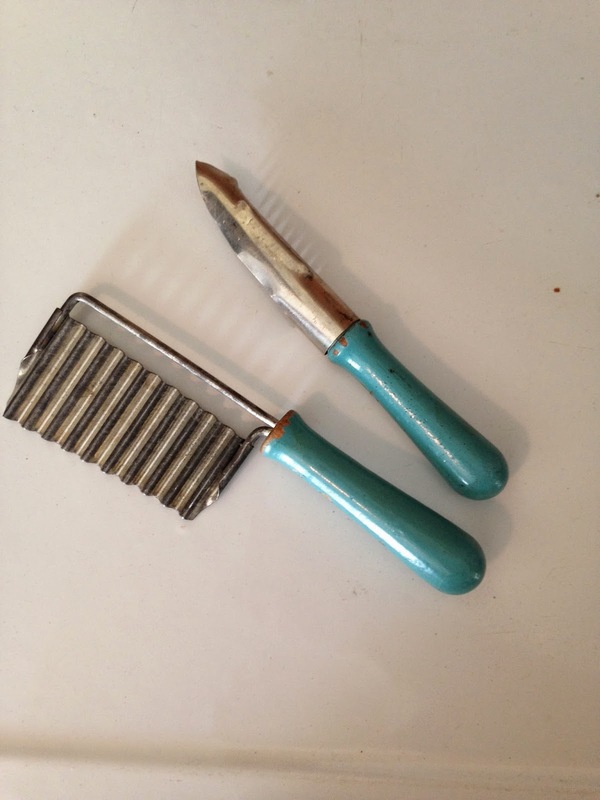 I also bought these 2 vintage kitchen utensils. You know I had to get them to go in the new turquoise/red kitchen. That's it! That's all I bought. I performed great self control! But I text my sister and told her to mark her calendar and plan a trip. I imagine I won't have such great self control with her along. 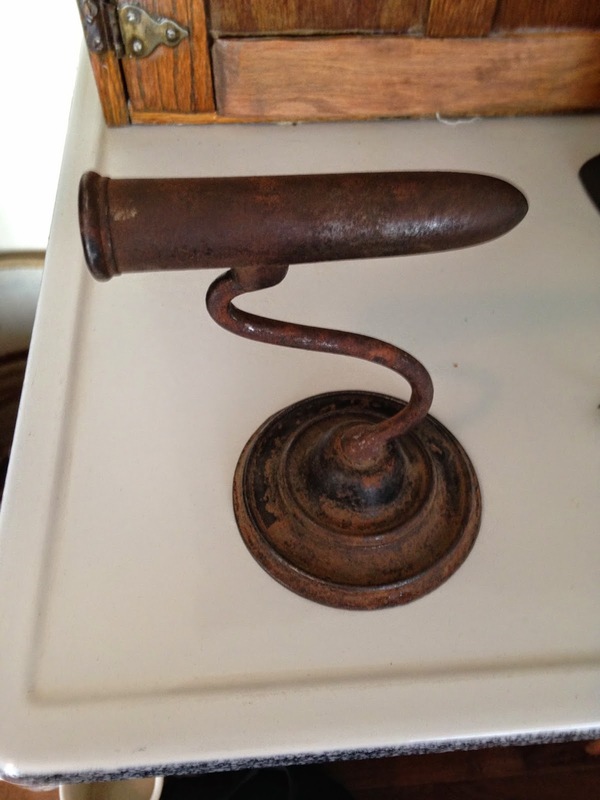 I haven't seen one before but I think it might be for heating a curling iron to use on hair.